Slipstream is a 1989 science fiction film directed by Steven Lisberger, who had previously directed the cult classic 1982 science fiction film Tron. It was produced by Gary Kurtz, best known for his collaboration with George Lucas on the first two Star Wars films and American Graffiti. Slipstream reunited Kurtz with his Star Wars lead Mark Hamill, who features alongside Bill Paxton, Bob Peck and Kitty Aldridge, with cameo appearances from Robbie Coltrane, Ben Kingsley and F. Murray Abraham. An aeroplane pursues a man running down a canyon, cornering him at a precipice. The plane lands and its occupants, bounty hunters Will Tasker and Belitski, chase the man and shoot him with a grappling hook. The fugitive looks at his arm, but seems intrigued rather than distressed. Tasker pulls on the rope and the man tumbles down the side of the canyon, but he is not harmed. Immediately after his fall, the fugitive quotes from the aviator and poet John Gillespie Magee, Jr.: "I have slipped the surly bonds of Earth–put out my hand and touched the Face of God." The fugitive's name is revealed to be Byron. The bounty hunters take their prisoner to a busy airstrip, where he stands beside them, handcuffed, as they eat in the diner. Matt Owens, a smalltime arms dealer, nearly gets his arm broken when he makes a pass at Belitski, then tries to sell contraband grenades to Tasker. It is then revealed that Tasker and Belitski are part of the remnants of a law enforcement agency, trying to keep the peace in a post-apocalyptic society. Tasker seizes Owens' weapons. However, as the pair are leaving, Owens takes Bryon prisoner so that he can claim the large reward. Belitski shoots Owens with a dart, both poisoning him and planting a tracking device in his body, enabling Belitski and Tasker to follow them. Owens and Byron first fly to Owens' home, Hell's Kitchen. There, Byron heals a boy blinded by cataracts, and Owens begins to wonder if Byron is more than he appears. After getting lost, they land at the home of a cult of cave-dwellers who worship the Slipstream and who have recently been under attack by bandits. Byron attempts to help, lifting a heavy milling stone off Avatar, the cult's leader. Avatar, in his dying words, curses Byron as being part of the out-of-control technological advancements that led to the apocalyptic Convergence. The cultists decide to let the wind decide what to do with Bryon, and tie him to a massive kite. The bounty hunters arrive in the middle of a windstorm, and Owens bargains with them to work together to get Byron down. Tasker reveals to Owens that Byron is an android. After a rough landing from the destroyed kite, Belitski allows Byron and Owens to get away. Another visitor to the valley, Ariel, helps them escape and convinces them to give her a lift home. Ariel takes them to her people, who inhabit a fortified underground museum. Byron's knowledge and appreciation of the museum's ancient contents lead to Ariel becoming emotionally attached to him. Byron and Ariel spend the night together, while Owens gets drunk and hooks up with a local girl. The girl helps Owens decide to free Byron, who has become his friend. Later, Byron reveals that the man he killed was his master. Byron also excitedly tells Matt that he has slept for the first time, and that he dreamed of a land at the end of the Slipstream, inhabited by other androids. Having tracked the trio to the museum, Tasker and Belitski force entry, killing guards and some inhabitants. After beating the Curator, Tasker forces the rest to find the fugitives. Byron is captured while Belitski shoots Owens in the chest with a dart; Owens retaliates by knocking her out and handcuffing her to a bed. She wakes and tells him that the dart is the antidote to the poison. Owens engages in a shootout with Tasker in which Ariel is killed. Enraged, Byron pursues Tasker to his plane. Tasker shoots Byron to no effect, then tries to run Byron down as he takes off. However, Byron manages to climb on and smash his way into the cockpit. As Byron is on the verge of killing him, Tasker quotes the Magee poem and he relents. He then attempts to regain control of the damaged aircraft by using the control wires, but it crashes. Tasker is killed, but Byron survives. He returns to the museum to find that Belitski and Owens are now a couple. Byron leaves to seek his promised land. Slipstream was the second feature Gary Kurtz made as a producer after splitting from his former creative partner George Lucas. Kurtz's early production credits included the films Chandler and Monte Hellman's cult road movie Two Lane Blacktop (1971). He then began his hugely successful collaboration with George Lucas by producing Lucas' commercial breakthrough, the low-budget American Graffiti (1973), which went on to become one of the most profitable films of all time. Kurtz then produced, worked as a second-unit director, and played a major creative role in the first two Star Wars films, but the partnership ended acrimoniously in the interval between Empire and the third instalment of the series, Return of the Jedi, when Lucas and Kurtz fell out over the creative and commercial direction of the franchise. Following the acrimonious split with Lucas, Kurtz acted as executive producer on the fantasy film Return to Oz, which was not a commercial success. He returned to commercial favour as the producer of the hit fantasy film The Dark Crystal in 1982. He evidently hoped that he could recapture his earlier success in science fiction with Slipstream, which co-starred popular actors from two of the major sci-fi franchises of the period - Hamill from Star Wars, and Paxton from Aliens. 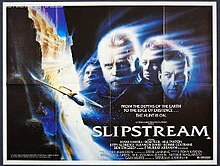 However, in spite of the many prominent names involved, including Kurtz, the cast, and distinguished Hollywood composer Elmer Bernstein, Slipstream proved to be a disastrous financial and critical flop. Its failure reportedly drove Kurtz into bankruptcy. The film is mistakenly believed to be in the public domain, when in reality it has a proper copyright notice in the end credits. Slipstream was filmed in Cappadocia, Turkey, Ireland, and Pinewood Studios, Iver Heath, Buckinghamshire, England, UK. Slipstream had a short cinema run in the United Kingdom, where it was considered a flop, and Australia, where the film grossed just $66,836 during its entire theatrical run. The film was never released in theaters in North America and enjoyed only moderate VHS sales. The film was released on videocassette by M.C.E.G. Virgin Home Entertainment in 1990. Several budget DVD copies of Slipstream have been released. Fans awaiting a director's cut have been disappointed after producer Gary Kurtz said in an interview that the script was originally much more violent, but that these violent scenes, which would have made the plot more coherent, were never filmed. It has also been released as a DVD double feature by "Destra Entertainment - Payless", the other feature being 1967's In the Year 2889. As of August 2017, the film has a "rotten" score on Rotten Tomatoes of 20%. ^ a b "Slipstream". British Film Institute. London. Retrieved November 10, 2012. This page was last edited on 2 March 2019, at 21:10 (UTC).